The Xerox WorkCentre 4250VS is a full-featured monochrome laser printer that supports copying, scanning and network faxing. It can produce high-resolution black and white prints on paper sizes up to A4, and it features an automatic duplexer as standard. Intended for mid- to large-sized offices that print frequently, this printer has a modern-looking design that will suit most office environments. It is a relatively quick printer with a first print out time of eight seconds. The Xerox WorkCentre 4250VS measures 24.5 x 19 x 25.5 inches and weighs 97lbs. It is designed to fit easily on the corner of a desk. It supports connections via Ethernet and USB as standard. It is Energy Star certified and Blue Angel compliant. It has a colour touch display and buttons that are used for printer management. This printer has a primarily off-white colour with some blue highlights and a modern design that allows it to blend easily into most office environments. It allows printing and saving to USB as well as scanning to email. The Xerox WorkCentre 4250VS printer has a maximum printing resolution of 1200 x 1200 dpi and can scan and copy at up to 600 x 600 dpi. It has a standard paper capacity of 600 sheets and prints clear, high-quality prints. Capable of printing everything from envelopes to transparencies, this printer can print and copy up to 43 ppm in monochrome. With a maximum monthly duty cycle of 200,000 pages, this device is suitable for offices that print extensively. It supports ID card copying and booklet creation. 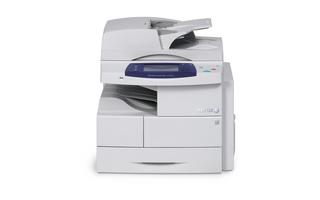 Unable to print in colour, the Xerox WorkCentre 4250VS printer may not meet all the needs of some offices. This printer is no longer sold as new, which may increase the difficulty to complete repairs as replacement parts may be hard to find.